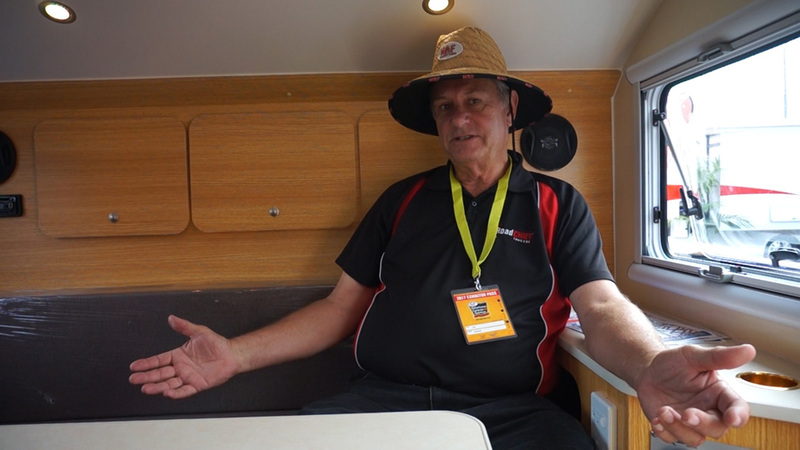 Last weekend I went to the Covi Motorhome, Caravan & Outdoor Supershow at the ASB Showground, Greenlane, Auckland. Quite a mouthful! I’d gone the previous year and was interested to see how I found it after becoming a caravan owner – now that I understand a little more about caravans. This year was busier and bigger! It has grown dramatically in the last year. The carpark was full and spilling into extra parking across the road. It was split into an inside and outside area. The inside seemed to be the big expensive brands, NZ Motorhome & Caravan Association (NZMCA), the accessory stores and NZ tourism destinations. Outside had a few of the quirkier brands, vintage caravans, a container house MORE motorhomes and caravans plus secondhand motorhomes and caravans. People were exploring inside all the motorhomes and caravans – sometimes lining up, waiting for a chance to squeeze inside – these vehicles are usually designed for 4 people! New models were being tested for kiwi interest. There were seminars happening through-out the day. 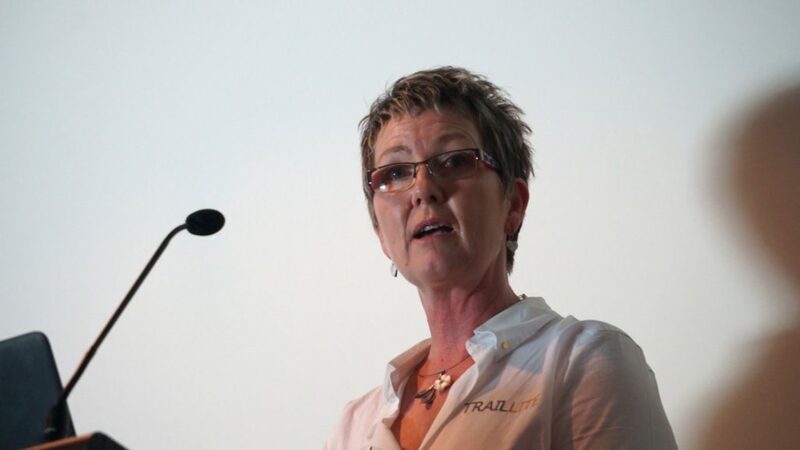 I made it to a seminar by Mandy Davis from TrailLite, talking about what to consider before purchasing. I liked how she focused on freedom camping and self-containment. Mandy talked about how much water, waste space, general storage, gas, battery capacity, solar panels and fridge space you need for staying out of town for a week. It made me wish I could afford a mammoth motorhome with all the fancy additions! She pointed out a few issues people have come across, like can you fit in the tiny shower? And is there enough seating area for your marriage to survive New Zealand wet weather? Is the bed actually comfortable? Plenty to consider. Next year, I’d like to see more of the seminars, particularly traveling around Australia. That’s on the one day wish-list. 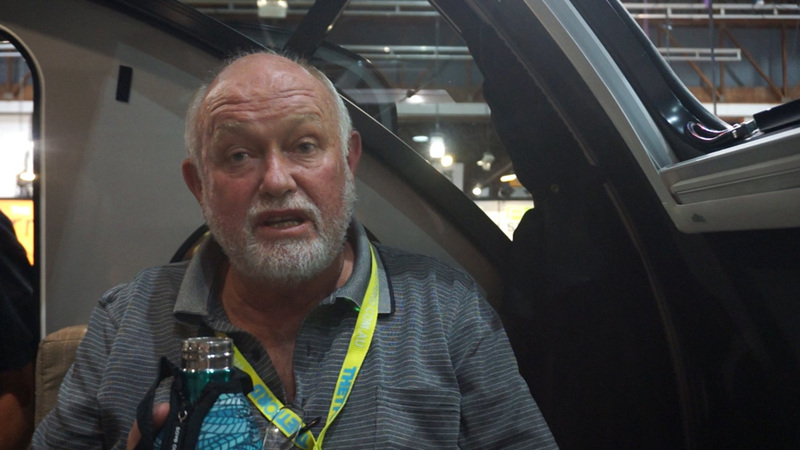 I met Bruce Stanger, President at NZMCA and bombarded him with questions. The one thing I’ve found with owning the caravan is how hard it is to find out how to look after my vehicle. My instruction manual is painful to read and doesn’t answer my questions. I’ve now learnt there are Advisers in the NZMCA I can contact with my many, many questions. The overall theme from people were about the community you gain from owning a motorhome or caravan. From sharing the experience with other travellers. There was a strong push with self-containment and looking after our environment. About how lucky we are to freedom camp and have access to Doc campsites, NZMCA sites and plenty of national parks. 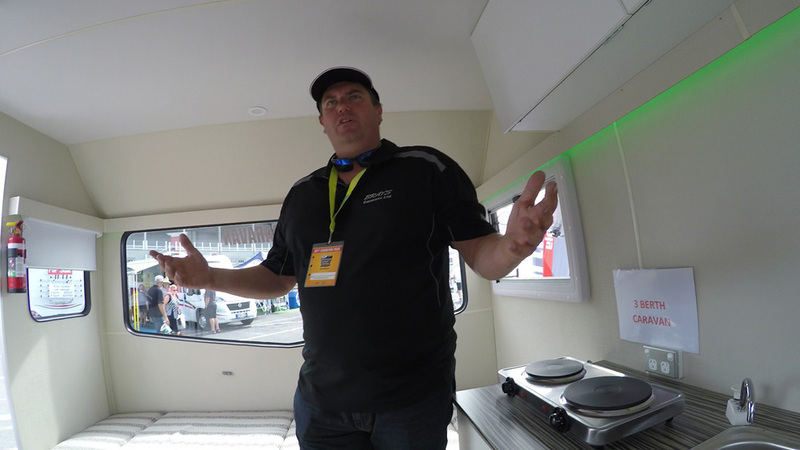 I looked in plenty of expensive motorhomes that cost $150k+. But have realised my personal interest is in the more alternative, affordable options. 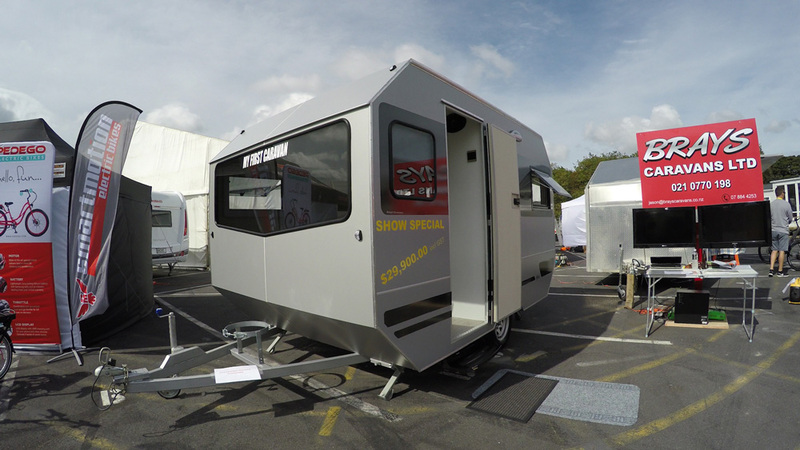 The designs that are easier to tow or the perfect introduction to caravanning. 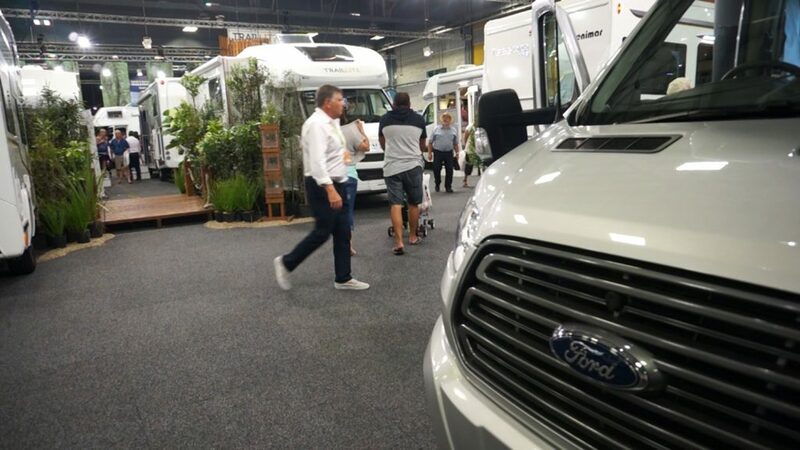 I managed to find a couple of teardrop caravans at the show. I had seen teardrop caravans advertised on Facebook and was keen to see them for myself. Both could be towed by a normal 1800cc car and were apparently easier to drive compared to a traditional bulky caravan. 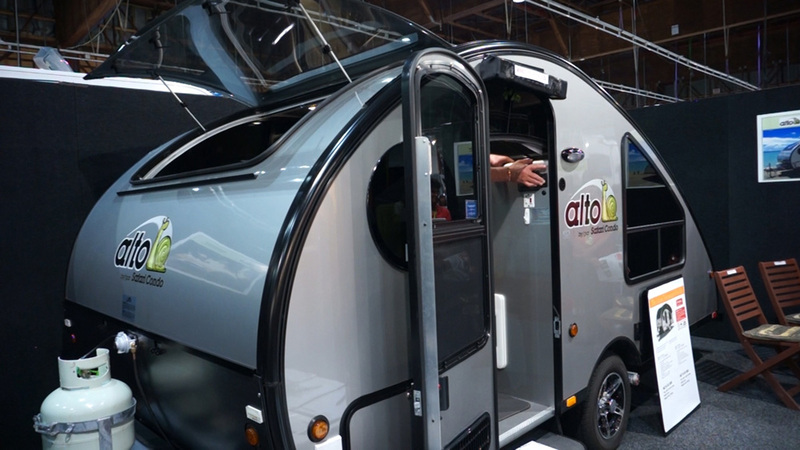 Alto Caravans had a Canadian teardrop caravan with a roof that rose to became the size of a normal caravan. Plenty of glass to view the scenery. The couple at the stall were passionate about their product. He was telling me how his wife felt comfortable driving it and they were able to use their normal car as a towing vehicle. 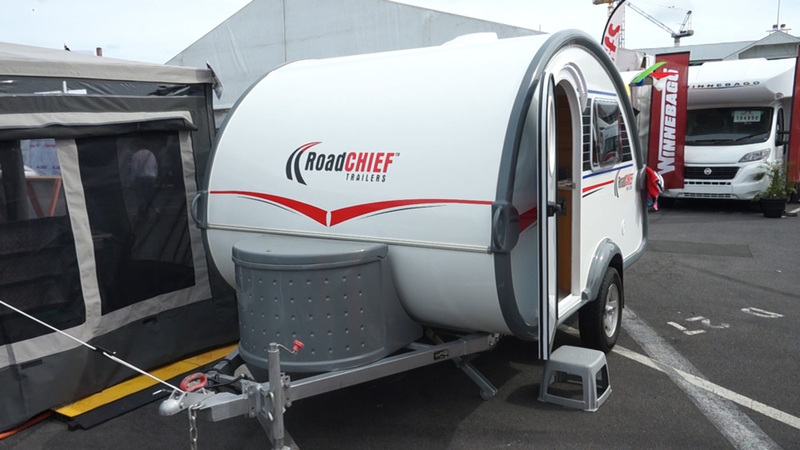 Road Chief Trailers are a smaller teardrop caravan. Super cute with a comfortable dining area inside that converts to a queen size bed. It’s got the kitchen in the boot area with the option of adding an awning/tent on for protection from the elements. It seemed similar to a camper van with more outside living, but the advantage is you use your current car to tow it. Near the end of the day, I found Bray’s Caravans and got quite excited. I’d read about them before but hadn’t realized they had a exhibit. Their caravan is VERY distinctive and have a similar layout to the old kiwi caravans. Jason pointed out that the new caravans are jam packed with too many extra fixtures that aren’t needed. The Bray’s still had plenty of energy to talk to me about their caravan, even though it was the end of the day. Jason has experience renovating the older vintage caravans, and he realized he could build a better and more affordable caravan himself. All the parts are from New Zealand with the advantage of being able to source them quickly. I particularly like the shape of the large windows, which make it easier to reverse – always a bonus. American Rockwoods are epic-ally large caravans. They have side-rooms that slide out to create more space. They are crazy big and seem very American in décor with solid fittings and chunky wood cupboards. I find it interesting how they make the most of their space with the pop-out components. There were plenty of other clever moveable homes. I particularly like the Ute’s with the living area on-top. There was a clever plastic pop-top for ease of towing. I couldn’t actually get inside to see, as there were too many people hovering around. And these are just a small sample of all the exhibits. Overall glad I went along and feel like I’ve learnt a few more things about caravans – which I definitely need to do. Suspect I’ll be back next year… hopefully wiser.